After the good victory on Wednesday night, we received a further boost yesterday with the news that Wojciech Szczesny has signed a new long term deal with the club. "We are delighted to secure the long-term future of Wojciech, who we regard as a very important part of our Club's future. "We have all seen his huge potential, both in training and in the matches that he has played for us, so we look forward to seeing him develop further in the coming years." It obviously great news that the club have secured yet another excellent prospect on a five year deal. You would have thought that this probably signals the end to Manuel Almunia's career at the club. Szczesny has been on the bench since Almunia's "elbow" injury. I'm sure many professional athletes would have recovered by now and can't help but think the Spaniard's absence has been down in someways to the fact we desperately wanted Szczesny to sign a deal. I would be surprised if we saw Almunia again in an Arsenal shirt, say for an appearance on the bench. The Sun report his basic pay has gone up from £2,000 a week to £30,000. 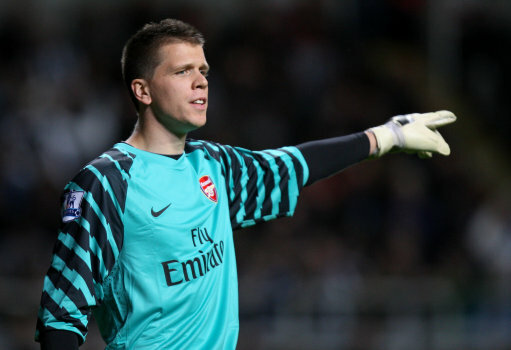 Szczesny did what any professional footballer would do and celebrated his deal.... with a trip to the cinema. I think this will also end our interest in Pepe Reina, who we're again linked with by the Daily Mirror today, and Germany's number one keeper Manuel Neuer. And the man who's currently in our goalkeeping jersey has been speaking about his performance at Molineux. "I was not happy about what happened last Sunday, but I was not thinking about making amends at Wolves - I was only trying to focus on having a good game. "The most important thing is that I'm getting some experience in the first team - I don't know when Manuel Almunia will be back, but I will keep doing my best and we will see what happens." I personally don't believe it was 100% his error which led to the goal against Newcastle, but I think he has shown in recent performances that he can be relied upon to produce some top class displays, notably against Manchester City. I do believe he has turned the corner, but it was surprising how many people were critical of him after the Newcastle defeat. It seems our keepers are just one mistake from being piled on the scrap heap. With Almunia's absence set to continue at the weekend, I think it's safe to assume that Fabianski in Wenger's eyes is our number one goalkeeper for the rest of the season. Elsewhere, the Daily Mirror are keen to point out we are the DIRTIEST team in the league because we currently sit at the bottom of the fair play league. Like we've always been told, trophies are not won in November. So hold your horses on this piece of silverware. As you might be able to tell from the headline, I've certainly got my tounge in my cheek with this one. But in all seriousness, I don't have a problem with this. I would rather we had steel to our performances to prove to people we aren't weak. And in any case, only Wilshere's red card was for dangerous play. Koscielny's dismissal at Anfield was a joke and his red card against Newcastle wasn't clear cut. Alex Song's early bath at Sunderland was down to him giving away to many silly fouls and then being unable to keep his head focused. Hardly dirty in my view but Graham Poll in the Daily Mail thinks Fabregas should have joined that list of player sent off for his challenge on Stephen Ward. "There's no hard feelings. It's just a mistimed tackle. "I appreciate him apologising. It shows the kind of player he is — these things happen in football." Many of the papers are running with the story that Bolton have put Gary Cahill up for sale to try and generate some cash to ease their debts. Arsenal were linked with him in the summer and with the continued absence of Thomas Vermaelen, the Englishman is an option. He's not played in Europe this season and won an international cap with England. The Guardian say Bolton would be looking for a deal in the region of £15 million and considering we've just spent £13 million on two defenders, I think we may balk at that price. Interestingly Arsene Wenger did not deny he would look to sign a defender if Vermaelen continues to be absent though injury in his pre-match interview with Arsenal TV Online. Henri Lansbury has been called up to play for the England under-21 side to play their German counterparts next week. Johan Djourou will play for Switzerland in their match with Ukraine, also next week. A player many Gooners go weak at the knees - Robert Pires if you hadn't already guessed - has said he would consider an offer from one of the top Championship clubs. "I am open to all offers, and if there is an opportunity with a good team in the Championship that is pushing for promotion then why not?" How I would love to see him back in the red and white at Arsenal. I know that's not being realistic, but what a player he was in his prime! And finally, Arsene Wenger has given his injury update to the official site. It is that Kieran Gibbs could be included in the squad to face Everton on Sunday. I'm sure the journalists at his press conference today will get more on the latest team news and bring it to us later.